The literal translation for the Braque Français is the French Pointer or French Pointing Dog. There are two types of Braque Français — the Gascogne and the Pyrénées. The more common of the two is the Pyrénées. The breed is much more popular in France and other parts of Europe than in North America and the United Kingdom where it is still rarely seen. It is, however, starting to gain popularity among sportsmen, especially in Quebec. The Pyrénées is a smaller dog than the Gascogne. 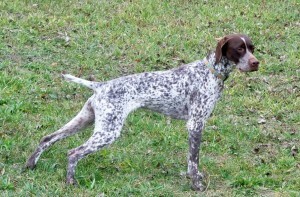 Both breeds date back to the 1600’s and are said to pre-date the modern short-haired hunting breeds. The Braque is known for his soft mouth and is a natural in the field and in the home. He is very intelligent, sensitive and affectionate. In the home he is very gentle with children and makes an ideal pet. He is an excellent tracker and hunting dog, a good retriever and a hard worker.